In the midst of September with autumn well on the way, Shu Ikeguchi, born and raised in Australia, visited Sapporo City in Hokkaido together with his father Ike, who has lived in Australia for 35 years. Shu, well versedin the culture of both Australia and Japan, provided a report on what drew them to the largest city in Hokkaido, a region famous in Australia for the powder snows of Niseko, and what they discovered nearby. In the morning, we rented a hybrid car in Sapporo City and made for Niseko some 90km away. It was great to be out in the crisp autumn air; the mountain roads on the way to Niseko were lined with trees decked in autumn colors, and we could have kept driving for hours. Our destination was Mt. Youtei, the main peak of Niseko area. The majestic outline of the mountain reminded me of Mt. Fuji, easily deserving its nickname of the Mt. Fuji of the north. The rivers by the roadside that snaked through the wilderness about us stirred up memories of the landscapes of Europe I had once travelled, and the waters were so clear you could see straight down to the riverbed. 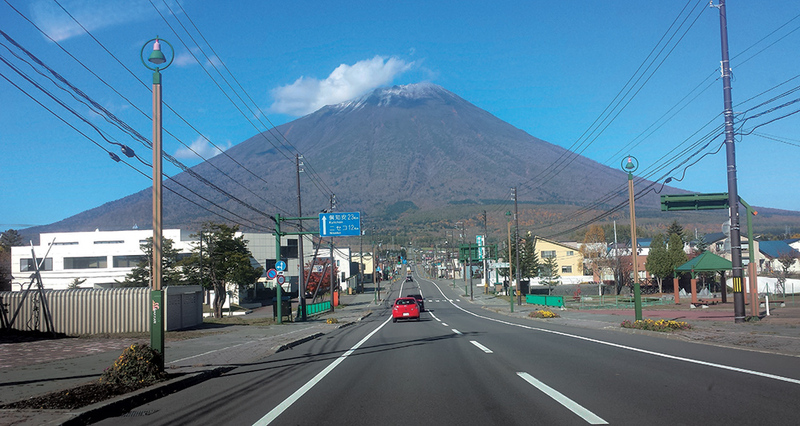 Reaching Niseko was easy thanks to the English language navigation system in the car. With its superb snow, the area has seen an increase in visitors from Australia over the past twenty years. And as the number of visitors has grown, so too has the town itself, quickly gaining an international reputation. During our stay, I met Australian marketer and ski resort development pioneer Paul Haggart. Though it was clear just how monumental an effort it had been for him to come so far, his plans and goals for the future were clear and promised greater things to come. Niseko can become the best snow resort in the world – I am sure of that. in the area. In the autumn, the area hosts a beautiful display of autumn foliage and a pleasant, dry breeze. The view of Mt. Youtei as seen from Grand Hirafu was incredible. That evening, we visited Yoichimachi on the Shakotan Peninsula overlooking the Sea of Japan to see the Yoichi Distillery of Nikka Whiskey, one of Japan’s most prolific whiskey manufacturers. The red roofs of the distillery buildings made me feel as though I was in Scotland. It was there that founder of the distillery, Masataka Taketsuru, also known as the father of whiskey in Japan, travelled and threw himself into learning about whiskey, later seeking a place in Japan to build his own brand. That place was Yoichi, its cool yet warm climate reminiscent of Scotland. The distillery Masataka created in 1934 to bring whiskey to Japan continues to produce fine whiskey today, and visitors can take tours of the whiskey production methods and processes. That night, we stayed in the port town of Otaru by the Sea of Japan not far from Yoichi. We went exploring the next day. Otaru is a beautiful town where you can see and touch the history of Hokkaido. It prospered on the back of coal imports and trade with Russia, a fact that the numerous modern buildings throughout the town can attest to. The Otaru Canal is famed for its beauty and is a popular location in movies and television shows, which in turn has drawn an increasing number of visitors from abroad. Given that you can see a side of a Japan from a hundred years ago, it was no surprise to see so many visitors with cameras in tow. The town is easy to navigate, and historic buildings like the Otaru Chamber of Commerce and Industry, the Bank of Japan, and the old rows of buildings with their galvanized steel make for a beautiful sight. Salmon can be seen swimming in the rivers, and the ivy creepers along the antique buildings lining the river were picturesque. Keen photographers will stay on past sunset, to catch the stunning scenery of the canal by night. Back in Sapporo, we visited the Shiroi Koibito Park, which combines the head factory of the Shiroi Koibito cookies famous in Hokkaido with an adjoining theme park. Here you can learn about the process used to manufacture the cookies and the history of chocolate, and view works of art. The western-style buildings of the park look straight out of Switzerland, while the merry-go-rounds make it look almost like Disneyland. It is a wonderful spot for couples and for families alike. Afterwards, we went to see the Okurayama Ski Jump Stadium that served as a venue in the Sapporo Olympics, the Sapporo Beer Garden, an all-you-can-eat stop for Hokkaido’s famous Genghis Khan cuisine, and many other wonderful tourist spots, taking in everything we could. There is more to Hokkaido than just the skiing, and this trip showed me just what is on offer, especially around Sapporo. At an upper floor of JR Tower Hotel Nikko Sapporo where we stayed in Sapporo was a large hot spring bathing area with a spectacular view out over the city. On the floor above was a bar with an equally breathtaking view where we enjoyed cocktails of the hotel’s own recipe after a long, hot bath. The hotel staff spoke English, and were a big help in providing information about the city. Choosing the right hotel is an important part of any trip, and this one left us more than satisfied. 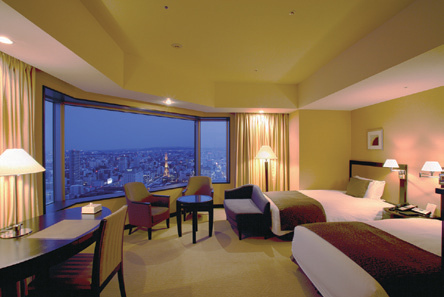 JR Tower Hotel Nikko Sapporo, run by JAL Hotels, combines the convenience of being directly connected to Sapporo Station with the luxury of a resort. 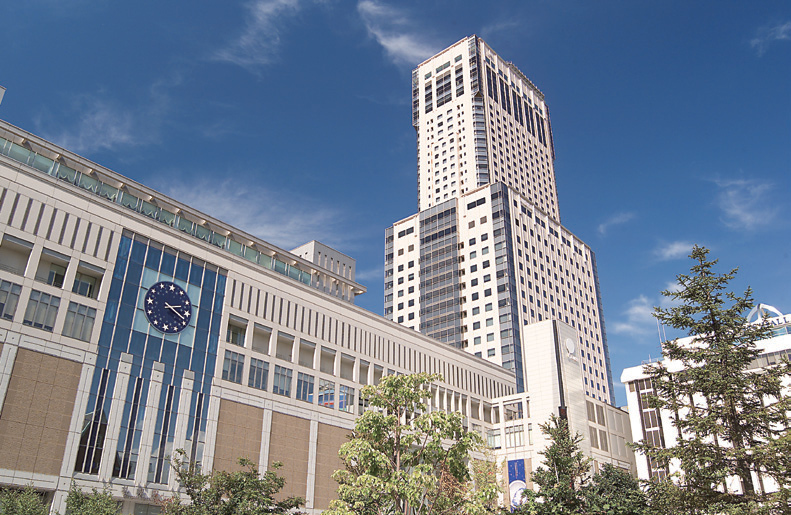 The hotel is built into the JR Towever, a landmark of Sapporo City that is built into the south exit of Sapporo Station. With natural hot springs that can be enjoyed from lookout-style spas, bars where you can kick back and relax, restaurants offering local cuisine, rooms with an eye for comfort, and views from high above, this hotel is a true urban resort.